I got married in 1991, and had my first baby in 1993. Back then, most people did not use cloth diapers, and the ones that did had diaper services. All we really thought about when it came to diapers, was convenience, cost, and keeping baby dry as possible. Health was keeping babies from getting sick. Today, just like anything else we throw away, the choice of diapers has become both a moral and wellness choice for us, our families, and the world. We want our children to be as healthy as possible in a wholesome way that benefits both our children and the earth that will grow up in. 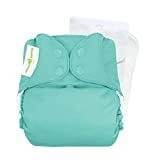 For parents who value the the absolute best health for their child, and would like to live an eco-friendly life, there is no question that the best choice is organic cloth diapers. Why organic cloth diapers? Babies develop so quickly, absorbing both good and bad substances through contact of whatever touches their skin. Organic cotton is free of the chemical pesticides that conventional cotton farmers use. That means that your baby will not absorb chemicals from his or her diapers. Cotton is a very soft, and absorbent fabric that is the best for diapers that touch baby's fragile skin. It is also easiest to wash, and keep clean. And by using cloth diapers, you save the landfills from filling with more trash, helping keep the earth healthier for your children to grow up in. In addition, there are a lot of chemicals used in creating disposable diapers. So having them next to your baby's skin is more likely to cause allergies and rashes. Which Diapers Do You Prefer? Aren't Cloth Diapers Hard and Messy to Use? Organic cloth diapers are not the nightmare that cloth diapers used to be. I remember trying to pin diapers on my sister when she was a baby, and I was always afraid that I would hurt her. Nowadays, cloth diapers use snaps or velcro to attach, so you do not need to worry about hurting your child. 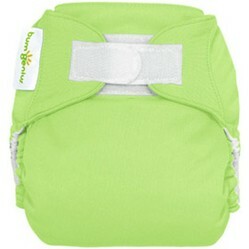 Another benefit is that the organic cotton is so much more absorbent than the old cotton diapers. 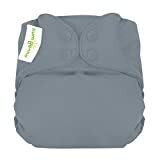 Technology has come a long way, and organic cloth diapers clean easier and stay in better shape than diapers did before. They are really just as easy to use as a disposable diaper, and in the long run, you save a lot of money too. Here is a list of the best organic baby diapers.